I love being an adult book buyer at a bookstore. When the publisher reps hear me getting particularly excited about something, they occasionally will send me a copy, and I was lucky enough to come home the other day to A Gross of Pirates sitting on the front porch waiting for me. It is no use pretending that these criminals do not evoke admiration – even envy. Part of the appeal is the democrati nature of their activities, characterised as far back as the 14th century by Klaus Stortebeker thieving in the Baltic – his crew were called the Likedeelers, the equal sharers. Author Terry Breverton has brought together the extraordinary stories of 144 pirates throughout history. They include Norman privateers, Barbary Corsairs, Elizabethan adventurers, Chinese pirates, the ‘Brethren of the Coast’ – and of course the pirates of the Caribbean. Beginning with the 9th-century ‘Shield Maiden’ pirate Alfhild and ending with Mohamed Abdi Hassan – ‘Afweyne’ (Big Mouth) – who ransomed supertankers for tens of millions of dollars, A Gross of Pirates is an exciting journey under full sail across a millennium of blood and treasure. I’ve been working on a fictionalized retelling of the adventures of Alfhild, the Shield Maiden mentioned on the cover of A Gross of Pirates for years now, ever since I was first introduced to her story in Princesses Behaving Badly five and a half years ago. So little information exists about her (her actual existence is itself debatable), I get particularly excited every time I see her mentioned somewhere and because of that, I probably own every book that references her. While A Gross of Pirates offers me no further information on my heroine, it does offer a great detail of helpful, factual, and entertaining information about 143 other pirates, many of whom this particular pirate enthusiast has never heard of. There are the typical suspects, Henry Morgan, Blackbeard, Anne Bonny, of course, and Breverton even includes my distant relation, Sir Francis Drake, who kick-started my pirate obsession when I was in the fifth grade. The others, though, were new to me. And as an enthusiast of mini-bio books (my term for books that include short features on numerous people), it has been a long time since I’ve come across new names! The pirates are grouped by time period, location, type of piracy, and each story seems more shocking then the one before. If you have any interest in a deliciously entertaining yet thoroughly researched pirate book, you cannot go wrong with A Gross of Pirates! I own more editions of Peter Pan than I care to admit. I’ve seen the movie of the Broadway musical with Mary Martin more times than I can count. And yet, as an adult, I’d never reread my favorite book. Until now. I have reenacted the story of Peter Pan, in the staring role myself, countless times throughout my childhood. The story of Neverland and the lost boys, the pirates, it all has fascinated me for a very long time. Last Christmas my husband got me tickets to see a reinterpretation of the play and it was the two of us, and two hundred children at the Arden Theater in Philadelphia. It’s a deep and abiding love I have for these characters, and their creator, J. M. Barrie. J. M. Barrie wrote Peter Pan, I am convinced, with the primary purpose of it being read aloud to children. Often times he address the reader and his prose affects that of a parent telling a tale that is well known and well recited. There are times when it goes on a bit too long – as when the children are first flying to Neverland – and there are words and turns of phrase that one would never find in a book published in the 21st century. However, as such is also offers a wonderful teaching point for small children (I refer here to the terms used for Tiger Lily and her community) as to not only how we address different groups of people, but also how language and society change over time. For being more than a century old, Peter’s tale is still one of childhood adventure and, most importantly in this, the technology age, of using your imagination. Children should have the opportunity to play act, to feel wild and free in the great outdoors, to be able to fall down and skin their knees without adults hovering over them waiting for the first sign of stress or a tear. Peter Pan embraces all that makes childhood exciting, and for that reason, and so many more, it is the perfect book for children of all ages. This book is about pirates. I have been fascinated by pirates for a very long time. In conclusion, pirates. Read it. Just kidding – full review below! The passion and violence of the age of exploration and empire come to vivid life in this story of the legendary pirate who took on the greatest military power on earth with a ragtag bunch of renegades. Awash with bloody battles, political intrigues, natural disaster, and a cast of characters more compelling, bizarre, and memorable than any found in a Hollywood swashbuckler, Empire of Blue Water brilliantly re-creates the life and times of Henry Morgan and the real pirates of the Caribbean. Seriously, pirates. I don’t know when, where or how my love of them began, maybe all little kids are born with a fascination of the pirate’s life. From Peter Pan’s arch-nemesis Captain Hook to Will Turner in the first Pirates of the Caribbean to Alvilda, the protagonist of my current writing project who is based on the Viking pirate princess Alfhild, my love runs deep. When a coworker first told me about Cinnamon & Gunpowder, I jumped at the chance to read it for the sole reason that it featured a female pirate! Everywhere that I’ve traveled from the Outer Banks in North Carolina to Nassau in the Bahamas, I have visited each locale’s respective pirate attractions and museums. In addition to pirates, I also love a good non-fiction book that can be affectionately referred to as “novelistic nonfiction” as exemplified by Erik Larson, among other authors. Talty’s prose also falls into the subgenre of nonfiction. I find that, as a bookseller, when I recommend nonfiction to primarily fiction readers, this trait is ideal. The pages turn quickly, the action moves at a good clip and the book holds the readers interest. Gone are the days of nonfiction being judged as dry and without character – half the time when reading I have to remind myself that the people in Empire of Blue Water are/were real people – not characters. Though when referencing Henry Morgan, the myths about him are hard to ignore. Additionally, Empire of Blue Water is not just about Henry Morgan, but about a great many other pirates who lived and raided around the same time, as well as the political culture of the colonies in the Caribbean, South, Central & North America. It is a fascinating and compelling read, and, of course, PIRATES! Do you ever look at your shelves of books and think “This book has been here too long.”? That’s how I’ve felt about A Darker Shade of Magic – I’ve had it since 2015 and I’ve been recommending it to bookstore patrons for just as long, but without admitting that I hadn’t read it. So now, it’s time, I have read it. And for the life of me I can’t figure out why it took so long. Welcome to Grey London, dirty and boring, without any magic, with one mad king – George III. Then there is Red London, where life and magic are revered, and White London, a city slowly being drained through magical war, down to its very bones. And once upon a time, there was Black London… but no one speaks of that now. Officially, Kell is the Red Traveler – one of the last magicians who can travel between the worlds – acting as ambassador and messenger between the Londons, in the service of the Maresh empire. Unofficially, he’s a smuggler, which is a dangerous hobby for him to have – as proved when Kell stumbles into a setup with a forbidden token from Black London. Fleeing into Grey London, Kell runs afoul of Delilah Bard, a cutpurse with lofty aspirations, who first robs him, then saves him from a dangerous enemy, and then forces Kell to spirit her to another world for a proper adventure. But perilous magic is afoot, and treachery lurks at every turn. To save all the worlds, they’ll first need to stay alive. It’s been quite awhile since I read a fantasy novel, longer still since I read one that is typically shelved on the adult side of the store versus young adult. This fact is one that makes my coworkers laugh, given that I am the staff member most likely to offer recommendations in said section. I’d been meaning to read A Darker Shade of Magic since it first came out shortly before I took my bookstore job in 2015 and first started hearing wonderful things about Victoria/V. E. Schwab. I certainly was not disappointed. Given how few fiction books have held my attention these days, the fact that I finished it in the first place is a massive endorsement. Kell and Lila are a fun pair of characters, equally matched in cleverness and wits and I appreciated that they were both well developed and quite wonderfully flawed. The plot was quick and enjoyable and, thankfully, the moments of suspense were done so wonderfully – I actually feared for the characters lives, despite knowing that further books in the series exist. Additionally, it doesn’t end on a cliffhanger! I was nearly jumping up in down when I got to the end and didn’t want to chuck the book across the room. Cliffhangers make me nuts – I’ve found I’ve mostly lost my taste for series these days and I enjoy a story that has a clear beginning, middle, and end. A Darker Shade of Magic can be read all on its own, but for the promise of female pirates in the second, V. E. Schwab has this girl hooked! I have no recollection of how/why/where I discovered Cursed Pirate Girl other than to say, once I did, I knew I had to read it. And I loved it. Now I need more. Please Jeremy, give us more! The Cursed Pirate Girl is on a quest in search of her father. It’s a journey filled with adventure above and below the mythical waters of the Omerta Seas. A nautical fairytale of strange creatures, whimsical characters, swashbuckling danger, and the most bizarre pirates you could hope for. It’s certain to amaze and captivate adults and children alike. Prepare to fall in love, and then have your heart crushed by this graphic novel. The storytelling and artwork is absolutely amazing – intricate details and fancy lettering are always welcome additions to any work of fiction (or nonfiction) in my opinion. The Cursed Pirate Girl meets all sorts of creatures that could only stem from a creative imagination on her adventures from the docks to the bottom of the sea to try to find her father. Sarah, you think, this sounds amazing! Why am I going to have my heart crushed? Because, gentle reader, who knows when you will get more. This is the first volume pictured, and back in 2015 we were promised 4 annual issues that would make up volume 2. Only one was ever released. Jeremy is still very active on social media, drawing often, and often characters from the series. But alas, there has been no update (at least that I’ve seen), about when our beloved Cursed Pirate Girl will return to us. Recommended for: Readers 12+, lovers of adventurous pirate lovers! I found this book on my very first visit to the Strand in New York City right after I finished student teaching. I’ve always loved multi-story books about historical women. Additionally, while reading this book at the Greyhound station in New York City while waiting for my bus back to Philadelphia, I stumbled upon my new heroine in my latest writing endeavor! You think you know her story. You’ve read the Brothers Grimm, you’ve watched the Disney cartoons, and you cheered as these virtuous women lived happily ever after. But real princesses didn’t always get happy endings. Sure, plenty were graceful and benevolent leaders, but just as many were ruthless in their quest for power – and all of them had skeletons rattling in their royal closets. The 30 “princesses” of Princesses Behaving Badly are grouped into 7 categories: Warriors, Usurpers, Schemers, Survivors, Partiers, Floozies, and Madwomen. Each little story about the princess of choice is written like a tabloid entry which some people might not like, but I thought it a great way to poke fun at the media’s obsessions with princesses and the aristocracy. Some notable women are excluded, i.e. Lady Diana Spencer, but for the most part, I loved learning about different women who are not so widely covered by my extensive collection of notable women books. Overall, I take books like this lightly and do not interpret them to be in-depth and extensive portraits of trouble maidens or explanations for the princesses’ often weird and strange life choices. That’s what biographies are for and this book makes no pretentions about trying to be a serious piece of deeply researched literature on the lives of 30 women who caused a stir in the lives of others over the course of the last couple of millennia. I am a sucker for Peter Pan stories, especially ones that provide a more interesting and compelling female character than Wendy! Why is a trunk holding “the greatest treasure on earth” aboard the stinking, worm-ridden ship? Does it contain gold, jewels – or something far more mysterious and dangerous? And what is Molly, the beautiful daughter of a rich diplomat, hiding from Peter? Turn back the clock on J.M. Barrie’s classic Peter Pan in this impossible-to-put-down tale of skullduggery and treachery, raging storms and bone-crushing battles, mermaids and talking porpoises. Peter and the Starcatchers is another book that I listened to after looking at it sitting on my shelf for 6 years, since I brought it home from Ireland back in 2009. Why? I have no idea – I love Peter Pan stories. So, in looking for books that would be decent to listen to while driving for work, I figured this would probably be a good bet. Read by Jim Dale (whose voice I fell asleep to for years as he also read all 7 Harry Potter books), Peter and the Starcatchers is a prequel to the classic, Peter Pan. It tells the story of Peter, an orphan, who is shipwrecked on an island and in search of a box of “starstuff.” But before the ship he was on, the Never Land, splintered on the reef surrounding the island, Peter befriended the mysterious and alluring Molly, protector of the magical starstuff, who tells him of the great power the material wields – it can change animals into otherworldly creatures and give humans special abilities, most notably that of flight. But Peter and Molly and Peter’s orphan mates are not the only ones shipwrecked on the island. The miserable first mate and his brute of a lackey are after the starstuff as well, but their intentions are more sinister. A pirate ship, captained by the terrible Black Stache, follows the Never Land to the island and are in search of the treasure as well. Peter and the Starcatchers is a fast paced, highly enjoyable, and entertaining tale of mischief and mayhem on the island that those familiar with the original story will quickly pick out as the wonderful Neverland. It is a story about children, but much like J.M. Barrie’s fantastical tale, it is not necessarily a book for children and highly enjoyable by readers (and listeners) of all ages. It is not often that I get the idea in my head that I absolutely must read a book at a particular time, but I decided this year before Christmas that I absolutely had to read Furiously Happy. My coworker, Jennifer, who loves Jenny Lawson, said “No, no. You have to read Let’s Pretend This Never Happened first.” And boy was she right. When Jenny Lawson was little, all she ever wanted was to fit in. That dream was cut short by her fantastically unbalanced father and a morbidly eccentric childhood. It did, however, open up an opportunity for Lawson to find the humor in the strange shame-spiral that is her life, and we are all the better for it. In the irreverent Let’s Pretend This Never Happened, Lawson’s long-suffering husband and sweet daughter help her uncover the surprising discovery that the most terribly human moments – the ones we want to pretend never happened – are the very same moments that make us the people we are today. I don’t often shove a book in my husband’s face and say, “Here! You MUST read this chapter right now!” Any time I have attempted this before, he groans and shoves said book out of my face. There aren’t many books that I’ve read that strike me as books he would particularly enjoy. But, while reading Let’s Pretend This Never Happened, I did this no less than 10 times. 10! And each time, he laughed too (which was very reassuring) and agreed with my declaration that Jenny, the author, and Victor, her husband, represent the two of us in five to ten years. There have been a few books, fiction mostly, where I have identified with the main character to the point where I declare, “me too!” (not in the present #metoo sense, but in an I-can-thoroughly-relate-to-what-you’re-saying sense). But this definitely falls into the same category of Hyperbole and a Half where I feel like I’m reading a slightly altered account of my own life. My father was a builder, not a taxidermist, I grew up in Pennsyltucky (rural PA), not rural Texas, but I also am the messy one in my marriage, met my husband in college, say things out loud at social gatherings that I really shouldn’t, and have generalized anxiety disorder, though my panic attacks are mostly triggered by driving. As Jenny writes, these things make me human, and they make me, me. And now I know that there are far more people like me than I previously thought. If you’re looking for a book that will make you laugh out loud and that you can thoroughly relate to, look no further than Let’s Pretend This Never Happened. A former co-worker first recommended Cinnamon and Gunpowder to me when I told her of my love of pirate tales. It then became a book that sat on my shelf for far too long until I decided it should be a book selection for my book club, the Modern Readers! The year is 1819, and the renowned chef Owen Wedgwood has been kidnapped by a beautiful yet ruthless pirate. He will be spared, Mad Hannah Mabbot tells him, as long as he can conjure an exquisite meal every Sunday from the ship’s meager supplies. While Wedgwood attempts to satisfy his captor with feats such as tea-smoked eel and pineapple-banana cider, he realizes that Mabbot herself is under siege. Hunted by a deadly privateer and plagued by a saboteur, she pushes her crew past exhaustion in her search for the notorious Brass Fox. But there is a method to Mabbot’s madness, and as the Flying Rose races across the ocean, Wedgwood learns to rely on the bizarre crew members he once feared: a formidable giant who loves to knit; a pair of stoic martial arts masters, sworn to defend their captain; and the ship’s deaf cabin boy, who becomes the son he never had. Cinnamon and Gunpowder is an incredibly fun book that is not particularly funny. Narrator Owen “Wedge” Wedgwood is press-ganged into “Mad” Hannah Mabbot’s rag tag crew of pirates with the express purpose of cooking a fine meal for pirate captain Mabbot every Sunday from whatever happens to be available in the middle of the open ocean as she continues on her journey to hunt down the elusive Brass Fox, who has been plaguing the shipping lanes in the early decades of the nineteenth century. Told from the staunchly anti-pirate Wedge’s perspective through makeshift journal entries on whatever scraps of paper he can find, Cinnamon and Gunpowder focuses on his relationships with the crew, the Fox, a mute cabin boy, and the captain herself. Despite constant escape attempts, Wedge’s opinion of his fellow shipmates changes, practically against his will, and he gradually finds himself enjoying the company of his compatriots on board. Cinnamon and Gunpowder was not the book I thought it would be and, for once, it was a very pleasant surprise instead of a disappointment. Eli Brown’s storytelling is superb and his cast of characters are richly developed and thoroughly intriguing. This was certainly unlike any other book I’ve ever read. I did not know culinary-piracy could be a book genre, but Eli Brown seems to have made it one all his own. I was not entirely sure what to expect when it was announced as the next book club read, but after hearing “female pirate captures chef to cook for her” I thought it would provide some good laughs and be a rather light read. Cinnamon & Gunpowder was a much more serious story than I was expecting. It took an honest look at the life of pirates, the dangers of opium addiction, and the politics and corruption of the East India (renamed Pendleton in the book) Trading Company. There were a few light moments, but after his kidnapping by Mad Hannah Mabbot, Owen Wedgewood’s life becomes extremely difficult, rather depressing, and occasionally infuriating. The story is told entirely from Wedgewood’s point of view as it consists of his musings that he writes down during his time on Mabbot’s ship. I understand that the story is told from Wedgewood’s point of view because he is most like the reader for he is taken from the comfort of his home and thrown into a world of which he knows very little. As he learns more about his captors, he begins to feel less like a prisoner and more as a member of the ship’s crew. For me, some of the best parts were when he was describing what culinary masterpieces he was making for Mabbot and how he managed to pull them off while living aboard a pirate ship. However, I think the book could have been even more compelling and enjoyable if everything had been from Mabbot’s viewpoint. Hannah Mabbot lived a long, tortuous, complicated, exhilarating life that we only learn through about through Wedgewood, and always through his eyes, whether they be judgemental or sympathetic. I enjoyed the story; I certainly learned quite a bit about both pirates and the British merchant aristocracy and how neither were wholly good or evil. I just would have enjoyed it more if it had been Hannah Mabbot’s diary I was reading, and not that of Owen Wedgewood. This book was recommended to me by a customer at the bookstore – and when I realized the illustrations were done by one of my favorite graphic novel artists, Skottie Young, I was sold. The elementary school teacher in me loves this book – it would make the absolute perfect read-aloud for any class from 2nd to 4th grade. The artist in me loves this book for Skottie Young’s illustrations. The reader in me? Well, I’m getting kind of tired of Neil Gaiman. My coworker would probably faux-smack me for saying it, but alas, I think it’s true. This book is, by all accounts, hilarious. Young children will find it absolutely hysterical. But I didn’t laugh. Not once. I’m not sure why, I felt like I was in the right mood/mindset to do so, but for some reason, I just didn’t giggle, not once. Fortunately, the Milk is the story a dad recounts for his two children as an explanation of why it took him so long to pick up milk for their breakfast cereal one morning. It’s full of adventure, time traveling dinosaurs, pirates, a talking volcano, ponies, all sorts of mischief and mayhem. But for some reason, I didn’t enjoy the adventure. Maybe that’s a commentary on the book, maybe that’s a commentary on me, I honestly don’t know. 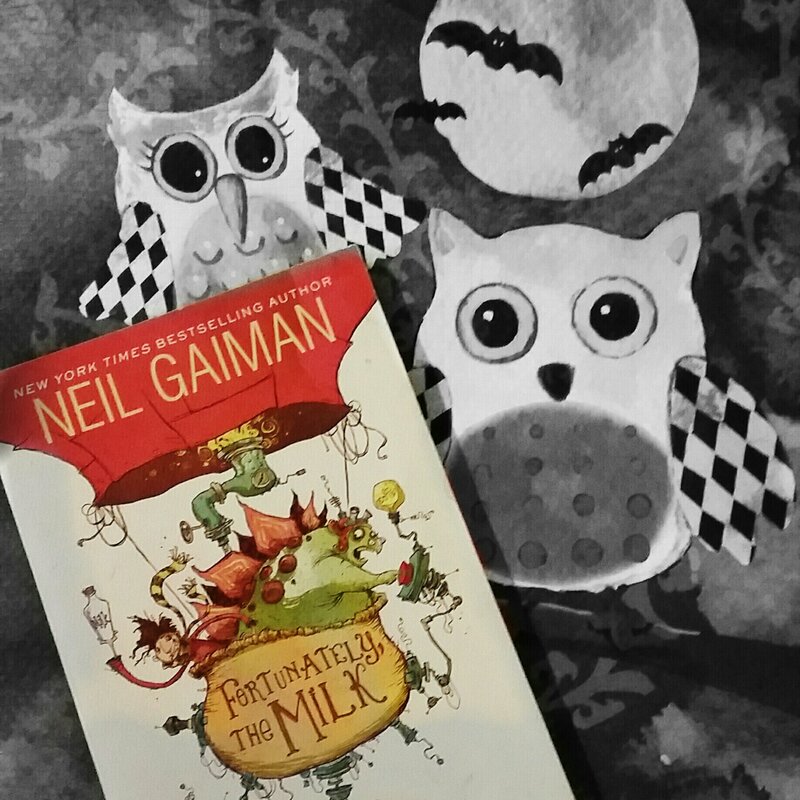 So if you love a book that is adventurous and exciting, if you are between the ages of 8 and 12, then please, take a look at Fortunately, the Milk, I bet you’ll enjoy it more than me.